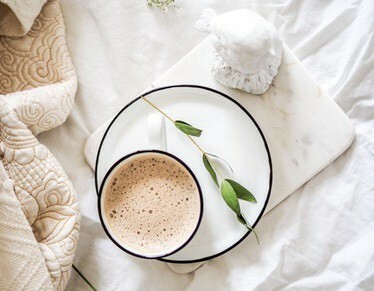 Home » Best White Coffee: Asking, “Where Can I Buy White Coffee?” See Here! Best White Coffee: Asking, “Where Can I Buy White Coffee?” See Here! If you’re on top of coffee trends, you’re probably asking, “Where can I buy white coffee?” right about now. It’s been around for years (it was popular in the Middle East first) but now it’s popping up everywhere. So where do you buy it and which brands are best? What Is White Coffee, Anyway? First, let’s talk about what white coffee is, in case you’re wondering exactly what it is that you’re hoping to try soon. It’s not just a new kind of coffee bean. These are roasted at 325 (as opposed to 450 or higher) and can’t be ground in just any old grinder. You’ll most likely need to buy it pre-ground unless you’re drinking it in a coffee shop (in that case, they’ll just grind it on the premises before they make your cup) or just happen to have a commercial grade grinder at home. Generally, it’s not brewed like a normal pot of coffee, either. It can be made that way, but espresso style is usually recommended. Just pay attention to the grind when you buy a bag. What you get with white coffee is a smoother, brighter, less bitter beverage with higher acidity than you might find with other beans. It tastes nutty and looks lighter in the cup than your average cuppa joe, too. It’s often served with a mix of spices, including turmeric, pepper, cardamom, cinnamon, and/or ginger. This mix is called Hawaji. It doesn’t necessarily have all of the spices above, but each shop may have its own combination of a couple (or more) that they use in their white coffee. You won’t usually find blends roasted in the white coffee way. Instead, the lower roasting temperatures play up the flavor nuances of single origin beans. You’ll often see 100% Arabica beans and beans from Brazil used in this type of roast. Beyond being trendy and cool, there are some additional benefits of white coffee. It’s extra strong, so if you’re a fan of getting the most caffeine possible out of your cup, this is for you. You’ll get a little bit of an extra boost. Keyword, little. It’s not a huge difference. Some people say it’s easier on their stomachs. It has a smooth, bright, nutty flavor without bitterness. It looks cool since it’s usually beige or taupe instead of brown or black. 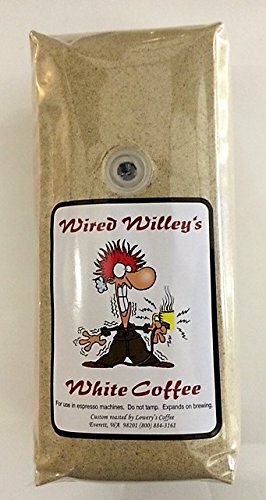 Lowery’s Coffee: Wired Willey’s White Coffee is available on their site or Amazon. Get it in 16 oz, 32 oz, and 64 oz bags. It’s pre-ground (necessary), high in caffeine content, and has a nutty flavor. The Lowery’s site says not to tamp it if you’re using it in an espresso maker because it expands when you’re brewing it. They do recommend using it in espresso drinks instead of brewing a regular pot of it. Even if you order on Amazon, the coffee will ship fresh from the roaster, so it’s not sitting around in a warehouse going stale. Expect to pay anywhere from $10.00 to $40.00 depending on where you order from and how big of a bag you decide to buy. 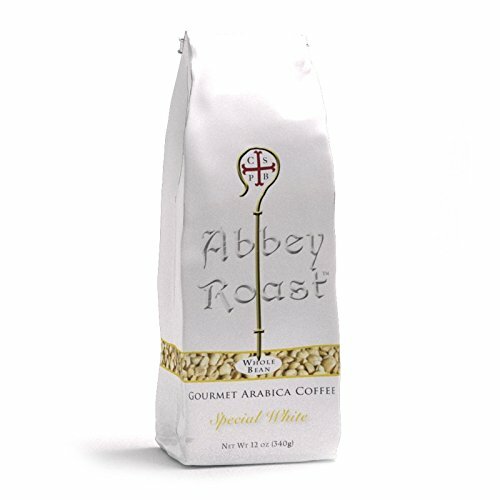 Abbey Roast uses a Brazilian Arabica for its white coffee, a bean that’s already known for a smooth, nutty flavor. While most white coffee comes with instructions to use it in an espresso machine for a fancier drink than everyday coffee, this one says you can use it in a traditional coffee maker, French press, or espresso machine. You’ll just need to choose the appropriate grind (medium for drip, coarse for French press, and fine for espresso). Get a 12 oz. bag for around $11.00 or go for the 5 lb. bag for $60.00 right on the Abbey Roast website. If you find that you really love white coffee and can go through it pretty quickly, the larger bag size may be perfect for your needs. You won’t need weekly (or even more frequent) shipments. You can, however, set up automatic shipments and have it sent to you as frequently as every week. Worried about shipping costs? Getting a 5 lb. bag or three smaller bags will get you free shipping. 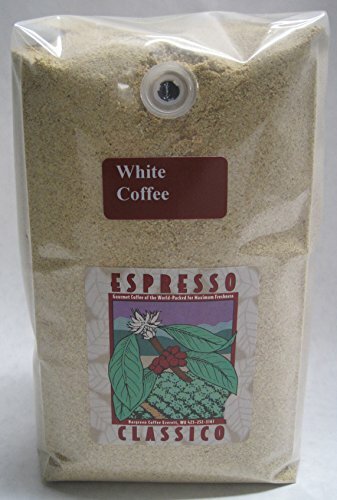 You can find Caffee Appasionato’s white coffee on Amazon. This one is made from 100 percent Arabica beans and costs about $25.00 for 2 lbs., with options to save a small percentage with the Subscribe & Save option. Have it delivered as frequently as once per month (as many bags as you’d like). Reviewers report a delicious, nutty flavor and a kickstart to the day that surpasses what they’ve gotten from their average cup of coffee in the past. This is smoother and does a better job of perking you up in the morning (or waking you up from that mid-afternoon slump). Some people compare it to the taste of tea. Even people who don’t normally enjoy coffee have said they enjoy this brand. Bargeen’s Coffee’s Espresso Classico White Ground Gourmet Coffee is one more option. It’s available on their site or Amazon. Grab the 1 lb. or 4 lb. bag from either place. Expect to pay between $10.00 and $15.00 for the smaller bag and between $30.00 and $40.00 for the larger one. It’ll depend on when and where you make your purchase. You can get free shipping on Amazon and pay minimal shipping costs on the Bargreen site, so it may end up costing about the same regardless of where you shop. It’s low in acid and high in caffeine, and Bargreen’s site says people have reported fewer stomach troubles after drinking this coffee as opposed to those higher in acid. Make it in an espresso maker or brew it up at home, with or without fancy additions. If you have a Dutch Bros location near you, you can buy white coffee beverages there. They’ve had white coffee since around June of 2015. Pair it up with chocolate and/or nutty flavors for the most delicious drinks. It doesn’t look like you’ll be able to purchase a bag of white coffee at Dutch Bros to take home and make on your own, but if you’re looking for a specialty drink with white coffee, give Dutch Bros a try. So now that you know what it is and what you’re looking for, where do you buy white coffee? Outside of hipster coffee shops, you can look online. Amazon, as demonstrated above, is the best spot to buy different types of coffee and compare prices between brands. Of course, you can always go to a roaster’s website to see what they ship and how much it will cost. Some roasters even have their white coffee for sale in grocery stores. You’ll need to check with the specific roasters to find out where in your area may sell pre-ground bags of white coffee. For example, Bargreen’s Coffee is limited to Everett, Washington, and the greater Northwest region right now. If you can’t get your hands on white coffee quite yet or you don’t have an espresso maker, you can get closer with a blonde roast coffee or espresso, like the ones that Starbucks offers. Admittedly, it’s not exactly the same, but you’ll be able to taste the difference between blonde and darker roasts. If you like that, you may want to continue your pursuit of white coffee. If you don’t care for it, you may decide to hold off on your search until it’s so easily accessible, it’s like it found you rather than the other way around. Though it’s totally different, there’s another kind of white coffee that’s worth mentioning. This one originates from Malaysia and is also known as “Ipoh white coffee.” The beans are roasted with margarine and then served with condensed milk. It’s a sweet, creamy drink similar to Vietnamese coffee. You can actually buy instant Ipoh white coffee online if that’s what you’re looking for. You’ll save yourself the prep work. A quick search for Ipoh white coffee on Amazon will show you quite a few options. When you want to buy white coffee, this is actually the easier one to find. Just be aware that they’re often pre-sweetened, so you won’t get a lot of control over the taste. Some people may confuse a flat white with white coffee, but they’re totally different. A traditional flat white is made with lots of steamed milk, some microfoam, and regular espresso. The espresso used in flat whites does have something in common with white coffee, though. It’s pulled in a way to ensure a smoother, less bitter flavor. But it’s not (or at least not always) white espresso. Whether you take to the online world to place an order or happen to stumble into a coffee shop that carries white coffee, it’s worth a try. Remember to check the grind on any bag you decide to buy online (and if they’re selling whole beans, just don’t buy it) and, if left to your own devices at a café, complement the earthy, nutty tones of the coffee with chocolate or other nutty syrups. Previous Post: « Counter Culter Coffee Review: Worth It? Yay or Nay?